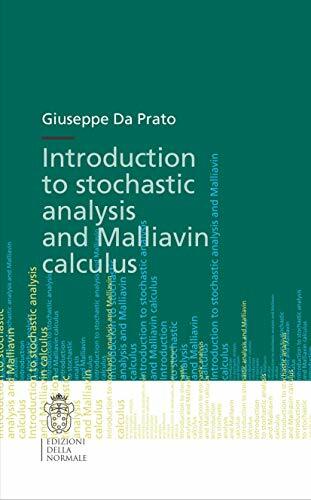 [PDF] Introduction to Stochastic Analysis and Malliavin Calculus | Free eBooks Download - EBOOKEE! Description: This volume presents an introductory course on differential stochastic equations and Malliavin calculus. The material of the book has grown out of a series of courses delivered at the Scuola Normale Superiore di Pisa (and also at the Trento and Funchal Universities) and has been refined over several years of teaching experience in the subject. The lectures are addressed to a reader who is familiar with basic notions of measure theory and functional analysis. The first part is devoted to the Gaussian measure in a separable Hilbert space, the Malliavin derivative, the construction of the Brownian motion and Ito's formula. The second part deals with differential stochastic equations and their connection with parabolic problems. The third part provides an introduction to the Malliavin calculus. Several applications are given, notably the Feynman-Kac, Girsanov and Clark-Ocone formulae, the Krylov-Bogoliubov and Von Neumann theorems. In this third edition several small improvements are added and a new section devoted to the differentiability of the Feynman-Kac semigroup is introduced. A considerable number of corrections and improvements have been made. No comments for "[PDF] Introduction to Stochastic Analysis and Malliavin Calculus".